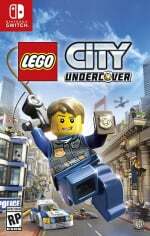 LEGO City: Undercover enjoyed its long loading time in the sun as a Wii U exclusive, but now the game is going full multi-platform. To see how the Switch port of the game stands up we decided to pit it side-by-side against the original on Wii U. Make sure you check out the video above where you can see both versions of the game alongside one another, with the Wii U on the left and the Switch on the right. Enjoy! Why does the Switch version look so dark? Wow what the hell? The lighting in the Switch version is practically non-existent. Some shadow effects are missing. Textures look blurry. What happened? There's literally no excuse for this game to look worse than the Wii U original. It doesn't even have to render a second screen! I'm sticking with my Wii U version, this is unacceptable. Interesting differences. Higher resolution (when docked, I assume) but a few choice textures are lower res. Or maybe it's just that one police department sign in the beginning that looks particularly scaled back. Lighting and shading seems a little more lush, but at the same time some scenes have a really dark feel, suggesting the port has not been supervised by the original art team, who always serve that bright upbeat LEGO feel. I'm in love with the idea of giving the player a minibuild to study during the load times, that's something LEGO fans are sure to appreciate. I had originally considered double dipping, especially with a smoother performance and higher resolution (loading times a minor issue for me), and fired up the Wii U version yesterday to find out if I would still enjoy it after 100%ing back then. I found that the Gampead was used very well in this game. Now I'm not certain if the lack of this wouldn't put me off too much... I now, first-world problems. I noticed that, too, but then I took a closer look: It's probably because the new version has a more comprehensive lighting system and something that looks like SSAO. While in the Wii U version many things look equally bright from all directions, which is unnatural, objects now apparently look darker where there is less light. That's my theory anyway. @Zach777 The lighting and some of the assets have been overhauled. On top of that the Switch supports the full RGB colour range, so the blacks are darker and so on. For my money (I captured the footage) the Switch version looks a lot better on my 50-inch TV, but there have been some interesting decisions in the remaster (obviously PS4 and Xbox One were also in mind). It's not exactly a slam dunk, either, as you can see there are glitches and strange graphical inconsistencies. Anyway, hoping to have the review with you all in the next day or two! The colours look much brighter and clearer on the wiiu version? Weird. I think the switch version looks better. The switch version also looks more colorful. Looks kinda satured. Still i wouldnt buy this game a second time for better graphics. But i definetely recommend this game. I had fun. The Wii U version looks a bit Blueish while Switch version looks a bit Reddish. I noticed from when Chase at Harbour. Don't know why I enjoyed that tagline so much. Never got the Wii U iteration, but I might grab this when the price is slightly more reasonable. Co-op play is surely too much to turn down! The Switch version definitely looks better in person. It's using better textures as well in many instances, the lighting system has also been overhauled. Frame rate is a different story though. If they can tweak the frame rate a bit, this will be a very good version. I think the Switch version definitely looks better if you look at some of the buildings in the beginning of video you can see more details as well the surfaces look better on the Switch version and the colors definitely look better the blue and black are very noticeably better in the Switch version however if you owned this game on Wii U I can't see what would be the point of purchasing it again especially seeing that it is priced way way way too high I mean 60.00 dollars for a five year old game with no new content , I will pass. Now bring on Lego Worlds . Actually there are some new disguises, including old Chase McCain police outfits that you have to unlock. Check on Youtube. One thing that's really giving me issues is on Switch, the mouth textures are producing some Z-fighting amongst themselves. Look at face close-ups. You'll see it in the first cutscene with Honey. There is also unusual shadow casting from face textures, something not done on the Wii U. Overall, the Switch version is better, but has various issues that put me off from getting it at the current MSRP (or even Prime discount). I bought it, and have played like, 15 minutes. It looks and feels good, but has some stuttering in the framerate. I remember the Wii U version doing the same. This does have the co op and a few added features, but i don't feel like any of them are enough to recommend going out and getting it if you still have the Wii U version. Myself, on the otherhand, sold the game back a long time ago, and i now have a son. I feel like I'll be getting my value out of a second purchase. @AlternateButtons uhm. I have both versions and Wii u doesn't even touch the switch version. Switch has better lighting, full rbg, better and more texture, longer draw distance, anti-aliasing and the background​ isn't blurry like the Wii u version. Well, uh, the loading screen is more interesting to look at. Why does the Switch version appear to have purposefully added motion blurring when you're driving? Starting around 10:20 in the video, you can see it's pretty obvious. NOTE: If you haven't already done so, manually update your game on Switch if it didn't auto update. It fixes some of the issues from the video above. I received my game today and played it a bit. I noticed that it didn't update, so I manually updated and started it again. The police sign and brightness in the police station look better now. @Nintendo_Alski Brighter does not equal better. The object edges and definition are much more refined on the Switch version. I also imagine the new lighting system and full RGB color range has something to do with the difference in colors. The Wii U one looks fuzzy in comparison. Really don't understand how from watching the video how anyone can say the Wii U version looks better. Who cares, they're frickin' Legos. What's a facelift going to do, make them shinier? Why waste time dolling up games for Nintendo gamers. They don't care about graphics. Just sell them the same game ten times. Easy money. Many that already bought the exact same games on the WiiU will also buy them again on the Switch. Then there are the newcomers and returners who gave the WiiU a miss now buying the games for the first time. Win win. All developers should port their old WiiU games to the Switch. @Amsterdamsters What about face texture shadow casting and mouth texture Z-fighting? Are those present after the update? Well I guess they are hoping those who did not buy it first time round will consider it now, since games are scarce. But the price they are asking for it will be the reason most Switch owners who have played it will give it a big miss until it arrives in the bargain bucked next year. Wasn't expecting much so it's good to see a tangible, if not massive, improvement. I'm getting this anyway for the portability and lack of Gamepad faff but it's nice to see other upgrades. Just to note, for what differences the game on Switch has from the Wii U version (for better or for worse), it is also close to 1/3 in game size by comparison, which is good for anyone who wants to go digital. Good to hear that it looks better in some instances! I'm picking this up solely for the multiplayer aspect. Looking forward to your review. @Discostew Makes me wonder what on earth they did on the WiiU that took MORE space for lower res textures? @NEStalgia My theory is duplicated data. They certainly had the space on a Wii U disc to do that if with all unique data would tally to 7.1GB. Duplicated data for a disc is beneficial because they could set up long load sessions (like the city) in such a way where the disc would practically stream from one point to another. Wii U's disc drive could only handle about 21MB/s when actually reading, but that doesn't take into account access time. Read jumps to different data points causes an access time delay, and discs are very bad with that because the read head has to physically adjust to wherever the next point is. It's probably "the" reason Sony and MS went with mandatory installs to HDDs. So, to duplicate data so it streams instead of jumping around, it reduced load times. If they kept it at 7.1GB on Wii U and made the read head jump around, you'd probably end up with double the load time. With Switch and the flash medium with internal storage, microSD or carts, access time isn't an issue. Plus the flash medium is already faster than Wii U's disc drive read speed, so overall faster load times. The Wii U version is more than adequate. If you have the Wii U version then you really shouldn't be giving them €60 for the Switch port. @Davidiam007 Why does it look so bad here then? In every comparison, the Wii U version looks brighter, more colorful and some texture effects like transparency in windows are absent in the Switch version. I don't understand how it's better. Honestly, they look practically identical. I own the game for both systems and I can barely tell any difference even when it side-by-side. Nobody's buying this game for better graphics- people are buying the game because it's the first and only handheld version ever released, and because it's also a console version and because the two can be played while seamlessly switching with the same save file. Let's not dance around the real appeal of the game here. It's why the game could even look worse and people would still buy it. Getting console games on a handheld and console together without needing save transfer tools and seamless switching is probably the biggest reason anybody has ever had to re-purchase a game. On other consoles, its graphics. On Switch, it's handheld + console version in one with seamless switching using the same save file. Either way, people always come back to a game they loved. Yeah, I have the Wii U version. But I want Switch version too. Just let me buy another one for $60. I don't mind to pay again for the game that I can play it anywhere. I know $60 is expensive. But the game is not 100% copy paste from Wii U. There are some changes, from Chase default outfit, Nintendo reference whether still included or removed from the remastered version, Hexagon design for U/I, New character disguises, Co-Op play, etc. I'm ready to double dip this title and play it on the go. Maybe I need to configure the Switch brightness first. I got this for £30, so I can't complain. Looks like a good enough port with some new co-op fun included and it's fully on the go. like the donuts at the first scene. the Wii U donuts look like chocolate. The Switch donuts look like..... smog? why? @AlternateButtons you need to have a better look then because even in this video you can see that it is sharper, more detail, has revamped lighting system were there are actual shadows and not baked ones. The Wii u one had horrible shimmering and artifacts and zero anti-aliasing and baked in lighting. Not to mention you are watching it through a YouTube's compression. I have both games and I can't even look at the Wii u one cause it IS THAT much uglier. Go find someone who has it and make a real comparison. Here's what I think is a better comparison video. @JaxonH that's funny cause I too own both and I can't agree with you. What, that they pretty much look the same? So buy this on Wii U if at all, got it. Warner Brothers is at again with their shoddy ports. @JaxonH I say that because the Wii u version in real life is blurry, with lots of shimmering artifacts, muddy texture, baked lighting and no anti-aliasing. The switch version is close to the PS4 version. They are the same game, but the quality is not the same. This guy's comparison is much better. @Hotfusion Kind of like all the Sony boys who bought TLoU on PS3 and then turned right around and bought it again on PS4? @36kobashi100 It's sold out and a seller is trying to sell it for £80.00! My copy is in the post.... from Amazon. Can't wait. @Discostew It doesn't look like those issues have been fixed yet. @Davidiam007 Ohhh okay I see it now. Those textures are a bit better. What's with the opening scene though in the Police station? it seems so dark and some textures look a bit worse. Its cause the switch has real time lighting and shadows. The textures seem fine to me just different lighting. It's looks so much better scene in actual live comparison then a video. Don't get me wrong I absolutely love my Wii u and that version as well, but if you have the switch I highly recommend getting the game or at least when it's on sale get it cause it's such a charm to play through it again. I went with PS4 version on this one. Runs fast, bright and colorful. If you want to see when the switch version really stands out as better looking than the Wii U version, just pause it at 9:19. Atleast that's where I saw the difference. Are you suggesting "Just sell them the same game ten times. Easy money. Many that already bought the exact same games on the WiiU will also buy them again on the Switch" is somehow exclusive to Nintendo gamers? Also I'd love to see all Wii U games ported to the Switch. It makes business sense as there will be a much bigger audience. Just got this game this morning and can't see any problems whatsoever with loading times. Excellent game. Looks like Lego to me, what else is there to say? For those who did not played Wii U version. @ThomasBW84 Full RGB colour does not matter other than a video comparison. Once you adjust your TV settings there is no difference between limited or full RGB. @Alex0714 Yeah. Deadly, for one second the Switch version looks better - for the rest of them the Wii U does. @Davidiam007 720P with no AA is blurry? @liveswired im not quite sure I understand your reply. The texture and background is a bit blurry on Wii u. I know this because I have both. I never mentioned resolution and I pointed out that there is no AA and that there is shimmering/artifacts. Wow. Wii U is way better. @liveswired If the Wii U looked better according to you, then it's a switch fail not a win. To me the switch looked much better and loads quicker so it's better. But if you like the way the WiiU looked then that's fine. Switch version is 1080p when docked according to IGN. Nice. @NEStalgia Devs don't generally make such drastic changes to a game on a platform because it could be physic or digital. "The colours look much brighter and clearer on the wiiu version? Weird"
No. I am saying it matters MORE to Nintendo gamers who have no huge third party support. Common sense dictates this. There are FAR more established developers on the other consoles giving gamers far more games and choice. Where are the AA and AAA third party games on the Switch or any Nintendo console? If all you care about are indie games, fine. Last I check they indie games don't sell consoles. If you can't see this let's leave it there. Eh? There are tons of remasters on every machine, even the ones with lots of Third-party games and lots of them sell. It's not, as you suggested, an issue exclusive to Nintendo machines. You seriously need to learn how to read. I am not deliberately trying to be disrespectful to you but you seem not to be able to grasp simple English. Where did I say it was EXCLUSIVE to Nintendo? I said it matters MORE to Nintendo. Forget it. I can't be bothered anymore. Whatever. @Alex0714 Yeah you're right...I was on the wind up that day!!! !